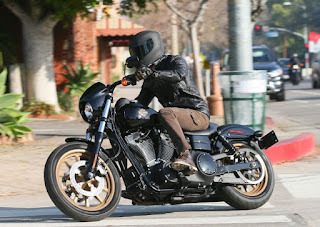 Imagine a Harley-Davidson. Now strip away all the chrome, black out the engine and add performance parts. It’s starting to look a lot more current and aggressive, isn’t it? 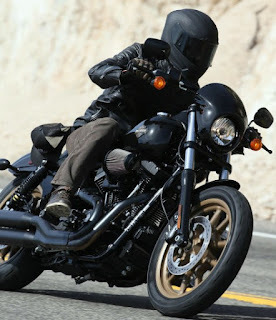 That’s pretty much what the iconic American motorcycle company has done with its dark Custom bikes. Launched back in 2008, they’re more edgy than the rest of the range, and can be easily customized further. At the launch of ‘Dark Custom, New Chapter', Harley rolled out 2 models it hopes will appeal to a wider - and potentially younger - audience. Harley-Davidson Dyna Low Rider S is an upgrade to the existing Low Rider, now with the colossal 1.801cc Screamin' Eagle 110 Twin Cam engine and uprated suspension. Love it or loathe it, you’ll form an opinion of the 2016 Dyna Low Rider S from the moment you push the start button. 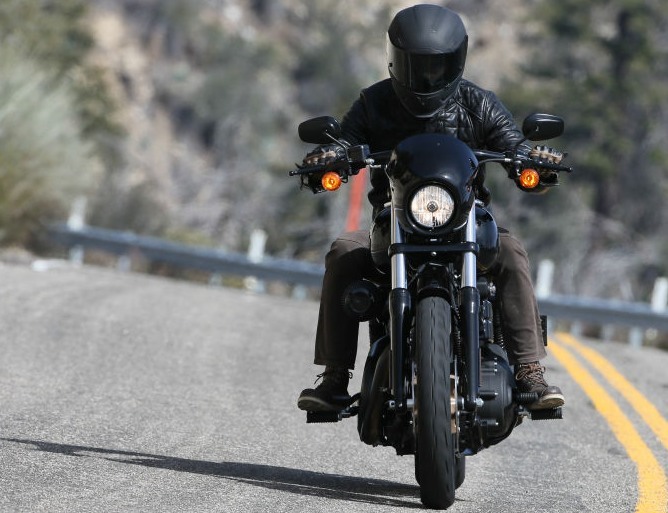 The air-cooled 1801cc V-twin engine may be rubber-mounted, but when you start the bike, you feel it come alive with a great shake – you can feel it pulsing through the seat, bars and pegs. This is a proper bruiser. Despite the relatively small frame of the 2016 Low Rider S, the wheelbase is an impressive 1630mm, but with the low seat at 685mm and a relaxed riding position, it looks very approachable. The bike only comes in black, with gold wheels, and for me, that combination works. The aesthetics are stylish with the only splash of colour being the red air filter. The clocks are housed on the tank rather than the front cowl, which looks good, but they do need a glance away from the road to see. There’s an analogue speedo and tacho, as well as digital display for trips, odometer, gear, time and range. The fuel gauge is also on the tank, opposite the filler cap. Screamin’ Eagle motor is spec’d-up from the H-D catalogue. 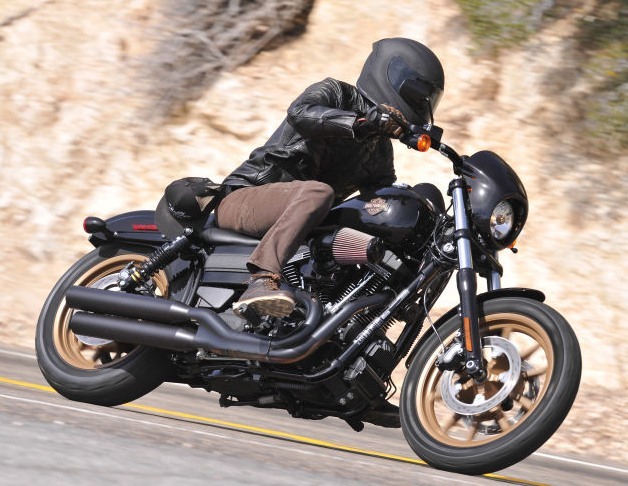 The 2016 Dyna Low Rider’s engine is big, powerful and surprisingly sophisticated. Harley-Davidson rarely quotes power figures, but peak torque is a claimed 156 N.m @ 3.500 RPM. With that amount of grunt, from that low down, it doesn’t tend to matter what gear you’re in, and if you do hit the limiter at 5000rpm, the engine simply stops adding power rather than send little jabs through your throttle hand. The six-speed gearbox transfers power to the belt final drive; on the twisty roads of the test I had little use of gears five and six, but on the bigger roads and combined with the cruise control, they should make high-mileage trips easier. The 2016 Harley-Davidson Dyna Low Rider S weighs over 300kg wet, but the low seat and fairly high bars create a relaxed riding position. The footpegs are halfway between the ‘standard’ position and a feet-forward set-up, which adds to the relaxed and comfortable feel. There’s nothing to grab with your knees during acceleration and braking, but the sculpted single seat keeps the rider firmly planted, and there’s no need to hang on to the handlebars. It doesn’t take much lean to touch the footpegs down. H-D says the lean angles are 28.5 degrees on the left and 27.5 on the right – it’s best to just take it easy, shave off a bit of speed in the bends and enjoy the ride. The suspension has been upgraded from the base model with the ‘Premium Ride’ emulsion shocks and cartridge-style 49mm fork. Rear preload is adjustable, but I was happy with the standard setting as the suspension was firm enough to feel in control in the corners, and progressive enough to not let little bumps in the road get in the way of riding comfort. The brakes feature ABS (non-switchable), with four-piston calipers and two 300mm discs at the front and a two-piston caliper and a single 292mm disc at the rear. There’s plenty of power in the brakes and the ABS kicked in pretty smoothly as I grabbed a handful and narrowly avoided a French driver who decided to pull out in front of me. Brakes won’t win any competitions, but they’re fine in a pair. The 2016 Harley-Davidson Dyna Low Rider S is a great bike if you like big V-engines, loads of torque and all-day comfort. It’s not the fastest or the most economical (claimed 44mpg) of bikes, but it brings a smile to your face as soon as you start the engine. It was surprisingly nimble for urban riding too. The clutch is slightly on the heavy side but with the amount of torque on offer, you can be a bit lazy with it. But the natural habitat of this beast is the open road, where you can make that big engine scream and let the fly-screen keep the wind off your body. At £14,995 it’s a big investment, but if you’re after a big bruiser, this one is bags of fun.